If you're going to or living in Bratislava during summer time there's a place that you should absolutely visit and enjoy: The name of this place is Zlate Piesky and is located in the suburb of the city 20 minutes by tram (electricka) from the city centre. The tram number 2 leaves from trnavske myto a big cross in the middle of Sancova a long road the starts from the central rail station (Hlavna stanica) and not far away (about 1 km) from Obchodna (the main street in the city centre). 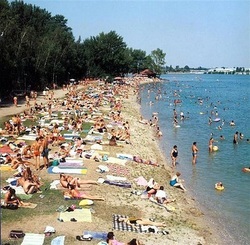 the tram terminate to Zlate piesky and the lake is just 3/400 meters far from the stop and just behind a big Tesco wher you can bay clothes and other stuffs for the beach. You can go there also getting buses number: 53, 56, 57,65, 630. In this place there are several beaches and in the summer time you can tan and drink a beer on the beach and more you can practice some watersports if you're a lover of it. Maybe you could also go in the beginning of september even if the whether is not as hot as in june, july or august. Devín Castle (Slovak: hrad Devín or Devínsky hrad, Hungarian: Dévényi vár, German: Burg Theben) is a castle in Devín, which is a borough of Bratislava, the capital of Slovakia. 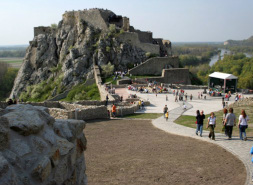 Devín castle likely is first mentioned in written sources in 864, when Louis the German besieged Prince Rastislav in one of the frequent wars between the Franks and Great Moravia respectively in the "castle of Dowina". During the Moravian period, a Christian church had been built in the complex. In 1323, the dukes transferred Pozsony county back to King Charles I of Hungary and Devín Castle became the possession of the heads (ispáns) of the county. In 1385, the castle was occupied by Margrave Jobst of Moravia who held it until 1390 when King Sigismund of Hungary redeemed it. Later, the king mortgaged Devín Castle to an Austrian knight, Lessel Hering who transferred the castle to Nicholas II Garay (the Palatine of the kingdom) in 1414. Around 1444, King Frederick IV of Germany occupied the castle but he granted it to Ladislaus II Garay already in 1450. A palace was added in the 15th century. Fortification was reinforced during wars against the Ottoman Empire. Since the 19th century as its history inspired several Romantic poets, followers of Ľudovít Štúr, Devín has become an important national symbol for the Slovaks. It featured both on the reverse of the former 500 Czechoslovak koruna banknote and the 50 Halierov coin of theSlovak currency. Bath town Bojnice, located on the Upper Nitra Basin contact with ledges Strážovských hills 2 km west of Prievidza, is only 170km far from Bratislava. In the town there is a protected national monument Prepoštská cave, which is part of Bojnice karst. Mineral springs gave rise to the spa, which are known since the 16th century. 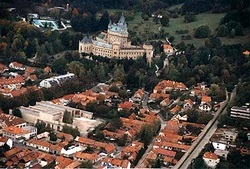 The most important building is the Bojnice castle, which together with the ZOO, is one of the most visited places in Slovakia. 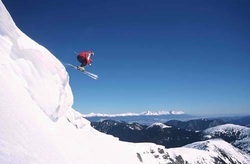 You can get there by train or by bus spending few euros.